This crunchy massaged kale salad with cranberries is great as a side dish or light lunch. With options for gluten free and paleo tweaks, this kale salad with cranberries will fit most any diet plan. It’s a great lunch or side dish salad. A couple of years ago a lovely woman named Pua introduced me to a kale salad with cranberries that I fell in love with – and I don’t love kale. As I watched her make the salad, she shared the recipe with me in a “little of this, little of that” kind of way. I made a big batch of it today, duplicating her instructions, and noted the measurements so that I could share the recipe with you. Seriously, if you’re one of those “Ew, kale!” people, this is a great recipe to change your taste buds’ mind. Why massage the kale? If you grow kale, you know how stiff it can be, straight out of the garden. It may be counterintuitive, but massaging the sturdy kale leaves makes them more palatable. Massaged kale salad has still got a nice crunch to it — it’s just a little bit more…relaxed. If you cook by feel, I totally recommend that you just eyeball the amount of ingredients. This is not a finicky recipe at all. The finished salad has a lovely earthy flavor and I find that I crave it. If I have it made in the fridge I keep going back for “just a bit more.” But there’s nothing wrong with snacking on kale all day, right? Especially if it’s straight from the garden! Make this kale salad with cranberries and almonds, or switch it up and add other ingredients. Sunflower seeds, pepitos, dried cranberries, nuts — toss in whatever you have on hand for extra flavor. 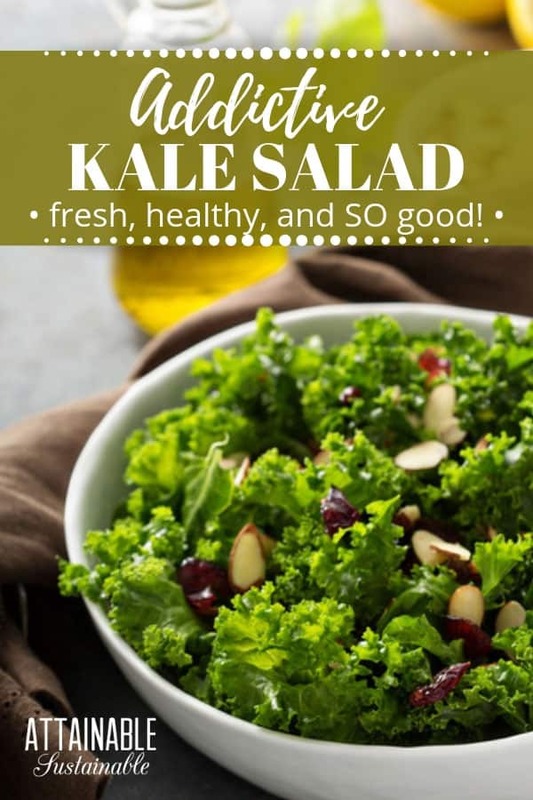 ★ Did you make this massaged cranberry kale salad? Don’t forget to give it a star rating below! 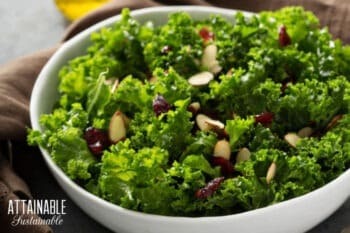 Cranberries help offset the bitterness of kale in this salad. Remove the stem from the kale leaves. Thoroughly wash and dry the leaves, then tear them into bite sized pieces. Place leaves in a big bowl along with the olive oil. Lomi - or massage - the kale leaves. Add the lemon juice and Bragg's; lomi some more. Add the avocado; lomi more. The avocado will add a bit of creaminess to the salad. Toss in the remaining ingredients. The add-ins are totally flexible. Try various nuts, different dried fruit, a bit of nutritional yeast, fresh slices of apple; really, the only limit here is your imagination. Try these roasted vegetables with kale. Saute the leaves with a bit of olive oil and garlic until they’re tender, then add eggs for a breakfast scramble. I use two leaves for three eggs. No use overdoing it and making everyone hate kale. Stir into marinara sauce. Kale disappears beautifully in marinara sauce – I use 6-8 leaves for a big stock pot. The people who don’t love kale don’t even know it’s there. Ditto for soups. I’ve stirred it into minestrone style vegetable soups and cream based chowders with equal success. Add two or three leaves to a green salad. 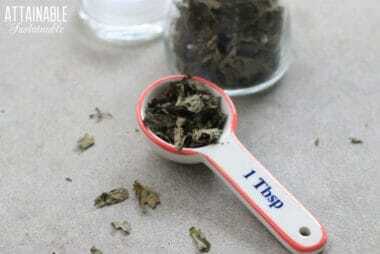 Toss several leaves into the pot when you’re making chicken or beef stock. Add a leaf or two to fruit smoothies. Make these savory muffins with kale and chive. Beyond the subversive use of kale, we love kale chips. Really. I originally just massaged torn leaves with olive oil and sea salt and dried them in a low oven. Yummy, yes, but then I discovered a recipe for cheesy kale chips and ho boy. Serious snack attack. Between those and this cranberry kale salad, we just might make our quote of veggies each day! Make those cranberries organic! I love massaged kale salad. I put peppers and tomatoes in mine. Will try your version. Thanks. How long does this keep? It doesn’t get soggy bc it’s kale? I’m hoping to plant make today. I think I’m late but better late than never 🙂 this sounds yummy. I just love salads. I’m bussing I wouldn’t massage the baby name they sell at costco? Just big kale? Woo! Autocorrect gone wild. 😉 I’ve had it keep in the fridge for a couple of days, but it’s usually gone long before that. It doesn’t get soggy like lettuce would. If the baby kale seems tender enough for you, then you can certainly skip massaging. Holy cow! I did that on my phone! I should have read it first 🙂 Hopefully you could translate. I’ve never actually eaten the baby kale in a salad. I always juice it. It is more tender than full grown kale so massaging may not be necessary. I’ll try it. Sounds yummy! Any thoughts on Liquid Amino replacement? I can’t get that here in NZ. Soy sauce. I use the Bragg’s because it’s wheat free. San-J also makes gluten free soy sauce. I buy the organic kind. 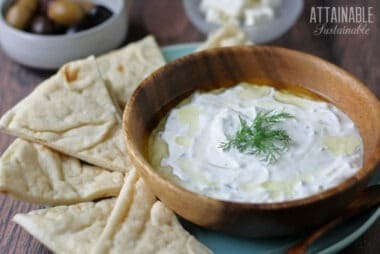 So easy to make and super tasty!